The ‘10 Minutes With…’ blog series is a way for me to share some ace small businesses that are doing their bit for the environment. I’m hoping to show you that sustainability can creep in to every corner of your life, even in ways you would never have thought of. I’m also aiming to share some wonderful small businesses to encourage you to explore local avenues before heading to huge, mass producing companies. Tell us about your journey leading up to the creation of Carnaby Cruisers – do you have a background in design? I was studying Architecture in Manchester a few years ago and became heavily influenced by two concepts - Craft and Sustainability. Designers and writers such as; William Morris - who advocates anti-industrial production, Peter Korn - who teaches of the benefits that craft can have on well-being, and William McDonough - who speaks about closed loop production cycles, are fascinating and I tried to take on board their observations. Essentially what I learned is the intimacy between the objects we produce and consume, and the present and future we create, whether socially, environmentally or personally. I have always tried to make objects and art, encouraged by my family, however what I have learned from researching craft and sustainability has given more meaning to this. 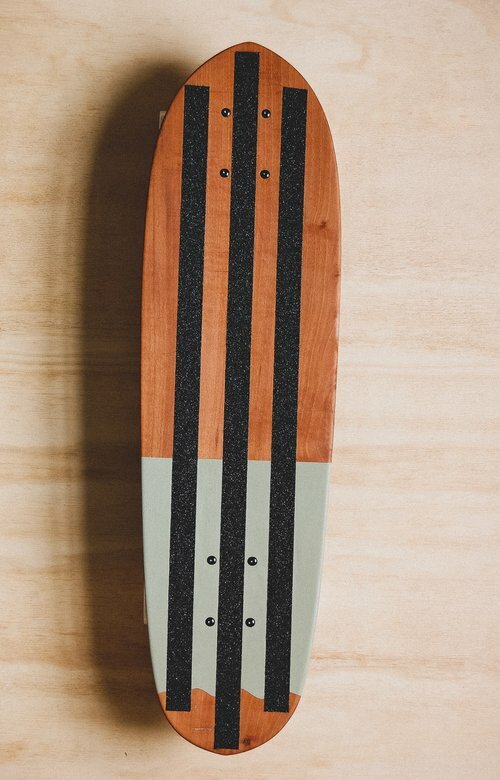 I began making skateboards as a way to learn woodwork as a skill and sort of meditation, and I wanted to make a product that could be either recycled or composted at the end of its life. I had limited tools but it was an enjoyable process. However it turns out I’m a bit of a perfectionist and making a product within a closed loop system is incredibly difficult, so I made another and another. Each iteration I tried to improve the design and materials used. It’s basically a fun personal project that I decided to make a website for. Since I was a kid I’ve always had a board and would take the wheels and trucks off in the winter when it snowed. I once nailed them on to a piece of 4x2 to try to make a longboard. Skateboards are an amazing example of industrial design that combine art, technology and simple materials- they are the ideal size to make at home and are fun and simple to use. What makes your boards different from others? I hand make every deck in the style of the original boards of the 60’s. They are purpose made for cruising around rather than performance in skateparks. The artwork is hand painted and screen printed so the boards will look good lying around the house. These boards clearly aren’t for everyone but it depends what you’re looking for. 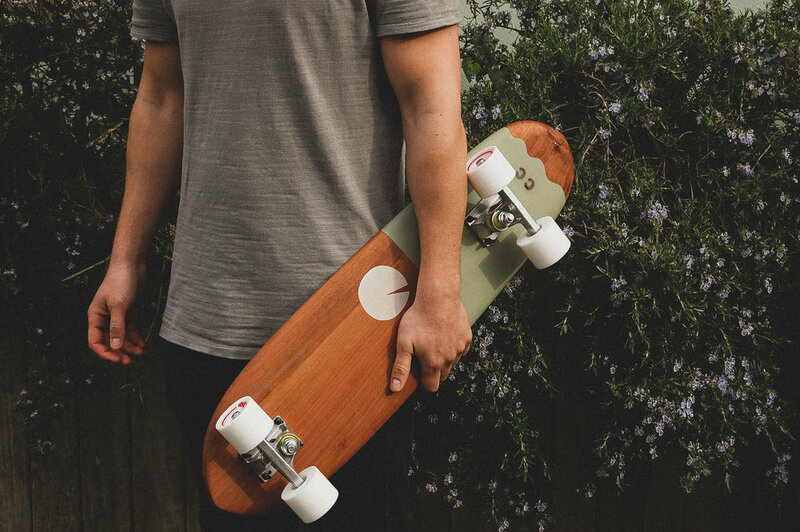 Your boards are made from ‘Sustainably sourced local timber’ – what makes it sustainable? In the past I have got timber from different places, always reclaimed from people who want to get rid of some off cuts. Recently I’ve begun getting alder from a timber yard in Wales who harvest timber from a woodland managed by the Woodland Trust. Are you making changes to your personal life to be kinder to the planet? I do but I would like to do more. It’s very difficult. It’s overwhelming how much waste we (as humans) produce. You’re based in Bristol – what’s the sustainability community like there? I think Bristol is quite progressive - new public transport links and bicycle lanes, less bin collections to ensure recycling, and zero waste shops are a few things I’ve noticed recently. For small businesses and individuals there is definitely a niche but I feel the larger industries view sustainability as an inconvenient hurdle to progress. What’s next for Carnaby Cruisers? To sell and make more boards hopefully, when time and money allow. I want to make some bigger boards and will be making my own paint. Mainly though I am excited about some wheels that I am making with a friend- an environmentally friendly alternative to standard polyurethane wheels- we are certainly no scientists but we are getting close to something that might really work. We are also bringing out some organic, handprinted t-shirts soon (now available on the website!). 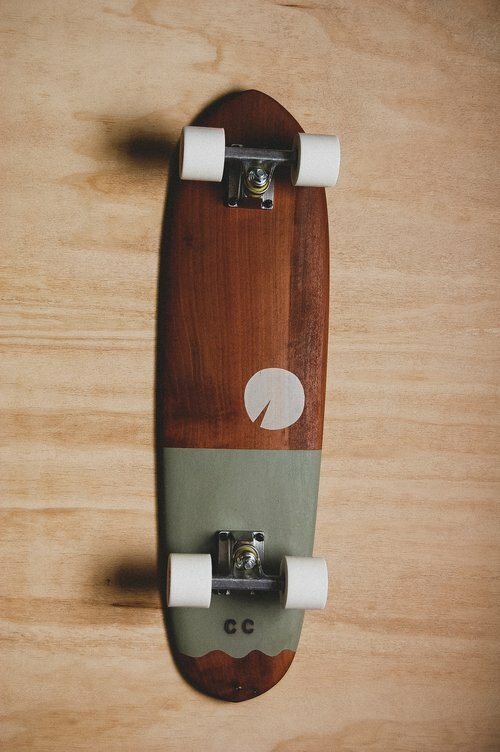 Where can we see/buy your boards? And keep and eye out for new boards and merchandise!